After reading The Girl Who Came Home, by the same author a year or so ago, I promised myself that if Ms. Gaynor wrote another historical fiction novel, I would run, not walk, to get my hands on it. A Memory of Violets is a worthy new addition to her repertoire. The novel is the story of Matilda Harper, a young woman from the Lake District who has nothing to lose by leaving home in March of 1912 to take a position in London at Albert Shaw's Training Homes for Watercress and Flower Girls, also known as the Flower Homes. The Flower Homes are a group housing arrangement for poverty-stricken crippled and orphaned former flower sellers. The residents produce beautiful, life-like artificial flowers to sell for charitable causes. Tilly arrives and takes up her position as assistant house mother to twelve girls. Through a chance meeting on the train to London and a seemingly random room assignment, she is drawn into the mystery of two sisters, flower sellers both who were separated years ago. One made her home among the residents of the Flower Homes, while the other was presumably lost forever. What transpires is the clever interweaving of historical fact and fiction (Albert Shaw's character is based on real-life British philanthropist John Groom). Tilly's character has a connection to the Flower Homes that she could not have possibly imagined. And the story of the two sisters becomes Tilly's story as well. 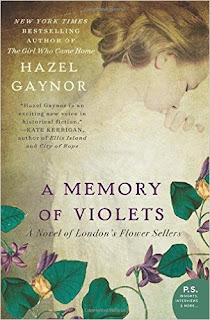 With clever dialogue, well-written prose, engaging characters, hints of supernatural intervention and many good and unpredictable twists and turns in this novel, Ms. Gaynor has presented her narrative in a heartfelt way. You can tell that this is a well-researched and well-loved topic for this author. The descriptive detail brings both the Victorian and Edwardian era to vibrant and fragrant life. Released by William Morris in February of 2015. Highly recommend!